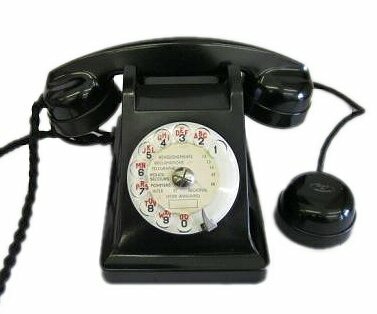 This classic French telephone was the telephone that brought voice communications to the masses. It was heralded at the time as a "universal" telephone when first introduced in 1943, and thereby got its name, the "U43". The U43 was an ambitious project at the time - it had to be compatible with a variety of legacy communications systems, whilst requiring as little metal as possible in its construction, as this was in short supply during the war period. For this reason, bakelite was chosen to be the material of choice for the body - a departure from earlier telephone design - which also allowed for more elaborate shapes to be conceived, resulting in the classic styling of this telephone. The attached "mother-in-law" listener became a feature of French telephones well into the 1970s. When not in use, the extra listener sits in its cradle behind the telephone out of sight. We often hear from people who have recently found our website, that they always wanted an original authentic bakelite telephone, but didn't know where to find them and, if they did ever come across one, it was usually in poor condition, didn't appear original, looked as if it might not work, or was priced way beyond their budget. We are therefore pleased to offer our genuine, high-quality, restored and working classic bakelite telephone range to those who wish to have the peace of mind that their investment represents value for money, is protected by a guarantee, and can be backed up with a full repair service if ever needed. These phones will work in virtually every country and, in many cases - if you let us know beforehand - we can make sure the telephone is delivered with the correct plug for your telephone network. All telephones have a 12 month guarantee. We also offer a full repair service. Bakelite - : Around the turn of the century, the Belgian born scientist Dr. Leo Baekeland, working as an independent chemist, mixed carbolic acid and formaldehyde to produce, quite by accident, a beautiful and versatile substance which came to be known as "Bakelite". Bakelite's many uses allowed it to become a standard item in the family home of the 1930s and 1940s, and was the standard material for making telephones during this period. 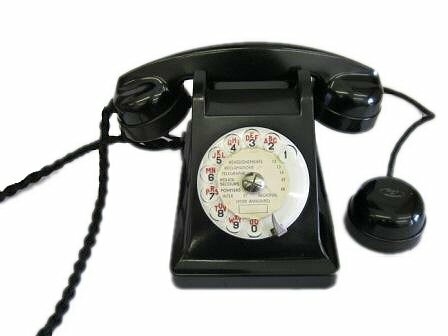 Although Bakelite could be produced in a number of colours, it was rare that the telephone companies exploited these possibilities; just like the early Ford motor car - "you can have any colour, as long as it's black".